The Holladays, established real estate developers, are perhaps best known for transforming the former Masonic Temple on the corner of 13th Street and New York Avenue NW into the National Museum of Women in the Arts. This year, NMWA has organized the New York Avenue Sculpture Project, a public art exhibit to take place in several segments, which is meant to bring more vitality and life to the downtown business district. The first installment will be the bright and bold sculptures of the late French sculptor Niki de Saint Phalle. In late 2008, Mrs. Holladay published the book, “A Museum of Their Own: National Museum of Women in the Arts,” which chronicles her journey to create the museum and her fight to get recognition for female artists. 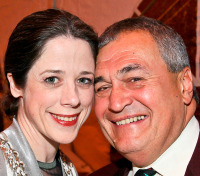 For years, brothers-in-law Robert Kogod and Robert H. Smith were at the helm of the Charles E. Smith real estate empire and helped to expand it into a billion dollar-plus enterprise. 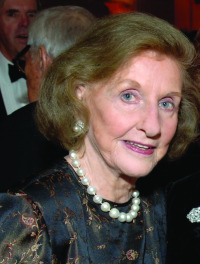 Smith died in December 2009, leaving an amazing philanthropic legacy, having donated funds for the Robert H. Smith School of Business at the University of Maryland in addition to the $130 million Clarice Smith Performing Arts Center there, Kogod donated the courtyard to connect the Smithsonian’s National Portrait Gallery and American Art Museum at a cost of $25 million. In 2009, both families committed $10 million for a transformational renovation of the Charles E. Smith Center at George Washington University. 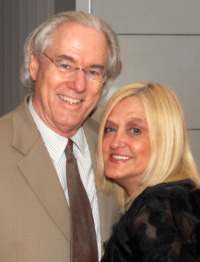 Despite With the family’s strong history of philanthropic work, there is no doubt that the Kogods and Clarice Smith will continue to support performing arts and other worthy causes in and around Washington. 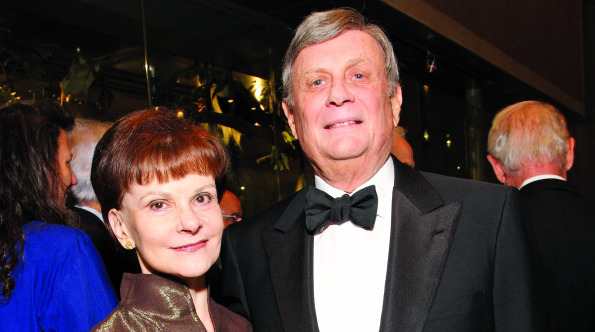 The Podestas have donated over 300 valuable contemporary works to the National Museum of Women in the Arts. If the Holladays have helped NMWA rescue artists from the past, the Podestas have enabled it collect living artists so they will be remembered and recognized in the future Heather also does other good deeds around town, including Red Shoe event, which was held at NMWA this year. Mitch is a major donor to the National Gallery of Art providing funds through the Glenstone Foundation. In an interesting twist on giving, he spoke last month at the Farmer School of Business at Miami University and gave each of the 900 graduates one share of Danaher Corporation stock, a company he and Steven founded in 1983. He advised them to hold on to the shares for a few decades, for an investment of $10,000 in Danaher stock in 1984 would be worth over $2 million today. Mitch has donated $325 million to the arts and children’s causes in cash and other assets. Steve Rales is a dedicated supporter of the Washington Ballet and DePauw University. Though the founder of B.F. Saul Real Estate Investment Trust and Chevy Chase Bank sold the bank to Capital One for $520 million in cash and stocks, he remains a major philanthropist and generous contributor to the National Gallery of Art and other art and cultural institutions. Frank Saul serves on the board of National Geographic, the trustees council of the National Gallery of Art as well as on the boards of the Library of Congress Trust Fund, and the National Sporting Library. He is an honorary trustee of the Brookings Institution, trustee emeritus of Johns Hopkins Medicine, and a life trustee of the Corcoran Gallery of Art. Tricia is co-chair of Friends of Blair House and is also active in International Neighbors Club, which helps to welcome foreign women to the D.C. area. Although he “retired” in 2003, George Vrandenburg seems to be busier than ever. A former AOL exec, he now serves as president of The Vradenburg Foundation, which supports healthcare & life science, arts & culture, health, energy, education, and homeland security by giving approximately $1.2 million away in grants each year. In addition to The Phillips Collection (where, as chairman, he is spearheading fundraising for the museum’s endowment), he and his wife are engaged, philanthropically and personally, in the Alzheimer’s Movement, the Chesapeake Crescent Initiative (a regional initiative to promote innovation in energy, healthcare and homeland security), DC Vote, Theater J, and Teach for America. Deeply committed to D.C. education reform, George serves as chairman for the D.C. Education Compact and serves on the boards of the Washington Scholarship Fund and D.C. Children First, a scholarship organization for low-income children and families. They are very active politically, and also publish Tikkun, a progressive Jewish magazine.